What did I buy, where did I get it and how much did it cost? Vendor's availability, quality and prices vary widely. You can often buy things more quickly and cheaply by shopping locally, so look around! eBay item #330298178472 provides 243 joules in each capacitor. I purchased twenty-four capacitors (two lots) for a total of 5,832 joules. I will keep several as spares. I will use much less than the rated voltage to maximize their life span. I paid $58 + $62.98 shipping for a total of $120.98 USD. 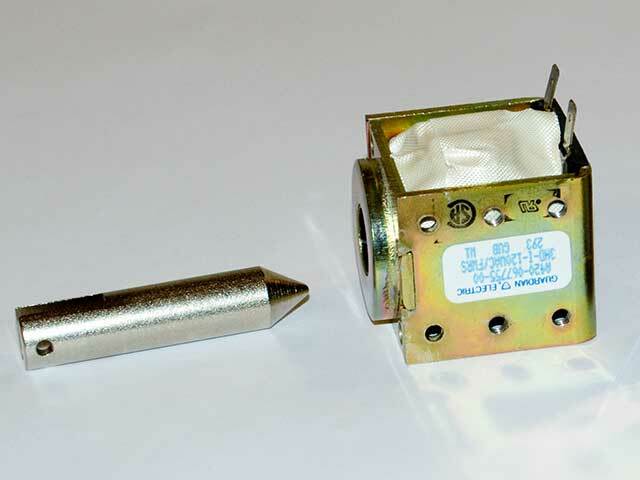 The capacitor is Philips part number 3186GH242T450AJA2 with this datasheet. eBay item 200280433943 is for two 120vac solenoids: Gaurdian 3HD-I-120A is a 120vac intermittent-duty actuator. It is interesting to note they contain, under their white-tape wrapping, a small bridge rectifier and filter capacitor. I paid $15.22 + $2.15 shipping for a total of $17.37. eBay item 350144840731 will be the wedge. It is only 3/8" thick so it will fit easily inside the 1/2" thick copper blocks. I paid $31.27 (1/2") + $11.75 (3/8") + $12.47 shipping for a total of $42.02 USD. eBay item 350141181498 will be the copper receiving contactor blocks. Class I (C11000) is commerically pure copper and is most commonly used for welding fixtures, anodes, bus bar in electrical power installations, ground straps, commutators, etc. It is easily bent, soldered, drilled, riveted and formed to fit almost any design specification. Class II (C18200) combines high electrical conductivity with high strength. Typical uses include welding electrodes, current carrying arms and shafts, circuit breaker parts, and all parts requiring higher strength than commerically pure copper yet requiring high electrical conductivity. Class III (C17510) has high thermal conductivity combined with good hardness, wear resistance and high temperature strength. Machines better than C110 alloy.